1Radiodiagnosis departments, Faculty of Medicine, Zagazig University). 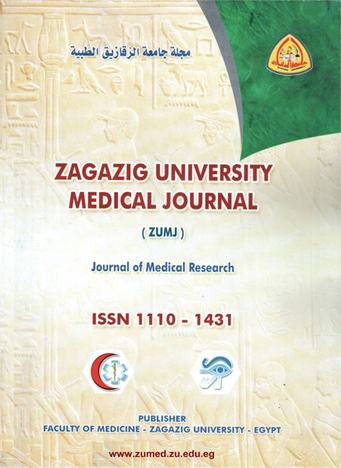 2gynaecology departments, Faculty of Medicine, Zagazig University). 3(Radiodiagnosis departments, Faculty of Medicine, Zagazig University). Cervical cancer is the worldwide leading cause of cancer-related death of women, especially in developing countries. The International Federation of Gynecology and Obstetrics recommends staging during surgery, however, surgical-pathologic staging would not be feasible in cases of more advanced cancers. Generally, in these cases, the staging is performed by means of clinical and gynecological examination and basic imaging studies. However, such an approach fails to demonstrate the actual extent of the disease, and does not include significant prognostic factors such as tumor volume, stromal invasion and lymph node involvement. Magnetic resonance imaging has increasingly been utilized in cervical cancer staging, since at early stages of the disease its performance may be compared to intraoperative findings and, at advanced stages, it shows to be superior to the clinical evaluation. Additionally, magnetic resonance imaging presents an excellent imaging resolution for the different densities of pelvic structures, does not require ionizing radiation, is comfortable for the patient, improves de staging, allowing the early detection of recurrence and the identification of reliable prognostic factors which contribute to the therapeutic decision making process and results prediction with an excellent cost-effectiveness. Aim: To asses the role of MRI in the accurate staging of cancer cervix compared with the clinical FIGO staging. Patients And Methods: A total number of 37 patients with untreated first diagnosed cervical cancer scheduled for MRI. MRI data were compared to the data of the clinical FIGO stage using our golden standard as referance . Results: Our study revealed that MRI can accurately stage the cervical cancer if compared to the clinical FIGO staging system. Conclusions: Magnetic resonance imaging is the imaging modality of choice for staging the primary cervical tumour, evaluate response to treatment and detect tumour recurrence and potential complications. Adequate patient preparation, protocol optimization and MRI reporting expertise are essential to achieve high diagnostic accuracy.